When used with an aqualis base series reservoir, pump adapter and reservoir form a virtually seamless unit. 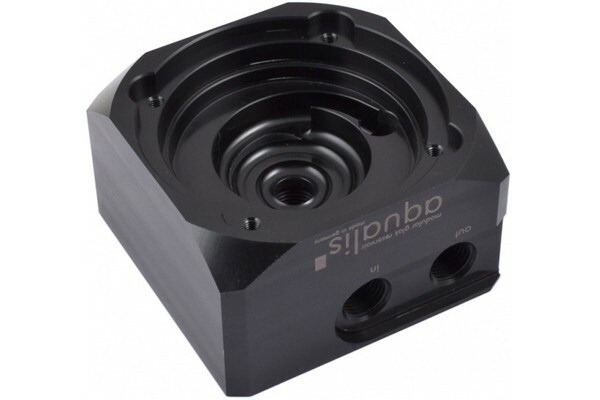 The sockets at the base of the reservoir slide into form-fitting receptables of the pump adapter and the gaskets on the sockets establish a watertight seal. When used with a reservoir, the threads on the side of the pump adapter must be used to connect the water loop. Please note that for use with aqualis series reservoirs, another version of this pump adapter with integrated fill level sensor (art. no. 52225) is also available. The adapter sold here (art. no. 52226) does not feature a fill level sensor! What are the dimensions for this product? Uns liegen keine Daten zu dem Maßen für dieses Produkt von Seiten Aqua Computer vor.